Improvement in retinal function seen after panmacular subthreshold laser in patients with dry AMD and inherited degenerations. • The effect of subthreshold diode micropulse laser (SDM) treatment has been narrowed to sublethal activation of RPE heat-shock proteins. • The proposed phenomenon of a chronic progressive disease stopping, slowing, or reversing progression and reducing risks is dubbed retinal protective therapy. • Based on pattern electroretinography and microperimetry, SDM appears to meet the basic requirements of retinal protective therapy, improving retinal function in a variety of unrelated chronic progressive retinopathies independent of imaging and visual function change. • SDM is ideal for preventive treatment because of its safety, simplicity, and effectiveness. Retinal photocoagulation may be the most important sight-saving technology of the 20th century. This is remarkable, considering that retinal photocoagulation is also a classic example of confused cause and effect. That is, from the advent of retinal photocoagulation until only recently, the wholly detrimental and unnecessary complication of treatment—retinal photocoagulation itself—was thought to be therapeutic. Severe iatrogenic multifocal chorioretinitis. Described this way, it is surprising that retinal photocoagulation improved anything at all, and it helps to explain why it has been largely replaced by modern drug therapy. However, retinal photocoagulation has been seen to be beneficial—despite retinal photocoagulation—and therefore it had to be somehow unleashing potent forces for good. For example, in the treatment of diabetic macular edema (DME), retinal photocoagulation is more effective than drugs in reducing macular thickness. And in eyes with lesser degrees of macular thickening (that is, most eyes), it is as effective as drugs in maintaining good vision.1 Clearly, retinal photocoagulation can do more good than harm. But how? C.S. Lewis, my favorite writer, died the day of John F. Kennedy’s assassination. One event overshadowed the other. Similarly, at the same time that intravitreal anti-VEGF agents exploded onto the scene, retinal photocoagulation was recognized to be simply an adverse treatment effect. Investigators had begun to reduce, but not eliminate, the retinal damage assumed necessary for effective treatment. Thus conventional treatment techniques, risks, and limitations remained.2-4 Then, in 2000, the laser was used in a new way. In “low-intensity, high-density” subthreshold diode micropulse laser (SDM) treatment, absolute avoidance of any retinal damage was, for the first time, a goal of treatment (hence low-intensity). This allowed a fundamental change in the treatment technique: completely blanketing target areas with treatment to maximize the therapeutic effects (hence high-density) (Figure 1). Beginning with DME, SDM was found to work better than retinal photocoagulation, without retinal photocoagulation or any other laser-induced retinal damage.5 Interest remained elsewhere. Figure 1. Graphic depiction of the effective surface area of various retinal laser modes: red = normal retina unaffected by laser treatment; brown = retina destroyed by laser, unable to contribute to the therapeutic effect—the cause of inflammation, loss of visual function, and all adverse treatment effects; orange = retina affected but not killed by laser exposure. Stimulation of heat-shock protein–mediated retinal repair in this tissue is the source of all therapeutic laser effects. Compared with other modes of retinal laser treatment, SDM eliminates adverse treatment effects while maximizing therapeutic effects. Reprinted with permission from: Luttrull JK, Dorin G. Subthreshold diode micropulse laser photocoagulation (SDM) as invisible retinal phototherapy for diabetic macular edema: a review. Curr Diabetes Rev. 2012;8(4):274-284. Reductio ad absurdum I: A good way to test any idea is to take it to its logical conclusion. Parents know this: “So, if all your friends jumped off a cliff, you’d jump too?” The safety of SDM was demonstrated by the use of fixed laser parameters to perform safe and effective transfoveal treatment of 20/20 eyes with fovea-involving DME.9 It was easy enough to understand the safety of SDM: You simply reduce the laser intensity until it does not do anything. What remained puzzling was how this could also be clinically effective. Drug therapy is an attempt to conquer the irreducible complexity of biological systems with brute force. Not surprisingly, Nature often objects, responding with a clever mix of indifference, unintended consequences, toxicities, and/or escape via tolerance. Physiologic processes, being perfectly tailored to a task, are not so flawed. Thus the keen interest in immunomodulation, 3-D organ printing, and stem cell therapy. Can shining just the right light on a problem help do the same? The strength of a theory lies in its power to predict. Reset theory had done well predicting anti-VEGF tolerance reversal. But reset theory also suggested that SDM should improve virtually any chronic progressive retinal disorder and, by virtue of treating early, slow progression and reduce the risk of visual loss. How? Reductio ad absurdum III: If RPE function is improved, it follows that RPE health, cytokine expression, and retinal autoregulation should also be improved (ie, normalize). In chronic progressive disease, the clock would thus be turned back to a healthier time—stopping, slowing, or reversing progression and reducing risks. We call this phenomenon Retinal Protective Therapy (RPT). But if this is so, how could one know? Figure 2. 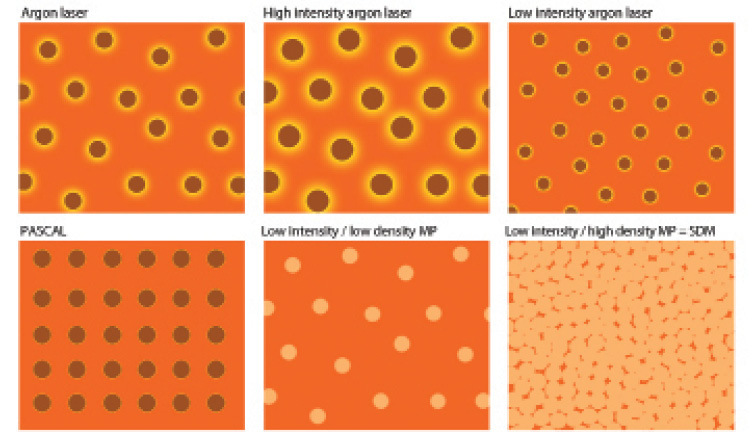 Ultrahigh-resolution photomicrographs of SDM acting on the RPE. A dysfunctional RPE cell (“Bob”) before SDM; note faulty switch setting (A). Effect of SDM on the RPE cell (note switch change), improving RPE function (B). Effect of SDM on general RPE. Note that, rather than being destroyed by photocoagulation, causing inflammation, loss of function, scarring, etc., the condition of the RPE is improved (thus normalized) by treatment (C). With high-density SDM application, recruitment of the RPE, and thus the therapeutic effect, is maximized. By definition, a preventive treatment improves physiology, not visual function or anatomy. Physiologic dysfunction precedes visual dysfunction, which typically correlates with anatomy, by years if not decades in age-related macular degeneration (AMD), diabetic retinopathy (DR), and most genetic retinal disorders. Vision loss and imaging abnormalities thus occur late, representing advanced disease—the Early Treatment of Diabetic Retinopathy Study notwithstanding. By conventional measures, effective preventive treatment can be detected only over the course of years of follow-up by comparing treated with untreated eyes. Patients with fovea-threatening geographic atrophy generally do not have this luxury of time (Figure 3). Thus, considering the safety of SDM and the absence of other therapies, and armed with the reset theory, it seemed reasonable to offer SDM to patients with dry AMD and inherited retinopathies in the hope of slowing disease progression. Mapping atrophy progression over several years suggested that the treatment was working. However, the inherent subjectivity of current methods of morphologic analysis (human line-tracing) cast doubt on the results. A more sensitive, objective, and reliable measure was required. Pattern electroretinography (PERG), developed in the 1960s, is an objective and sensitive test of macular function via the inner retina and ganglion cell layer. Done in a single lab by well-trained operators, PERG has been shown to be highly repeatable and reliable.11 So, in fall 2014, I decided to see whether PERG could detect SDM effects where imaging and gross visual acuity testing could not. Figure 3. 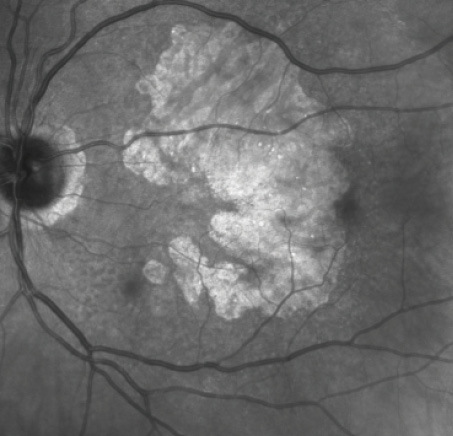 Eye with AMD and fovea-threatening geographic pigment atrophy. Visual acuity 20/50—for how long? In another victory for reset theory, after SDM, PERG demonstrated prompt (within 1 month, but as early as 4 days) and significant improvement in macular function in the first 92 of 93 tested eyes; 85 of 86 eyes with high-risk AMD, and seven of seven eyes with genetic disease (three with retinitis pigmentosa, three with cone-rod degeneration, and one with Stargardt disease). Of these, 40 consecutive eyes also improved by concurrent microperimetry (P = .0164). Snellen visual acuity was stable, and there were no adverse treatment effects.12 As of this writing, 22 of 25 eyes with 6 to 9 months follow-up maintain improved macular function by PERG. As further predicted by reset theory, PERG responses were disease-specific: AMD improved most by the low-contrast scanning mode (P = .0051), but inherited diseases improved most in the 24˚ concentric ring scan (P = .0107). Fulfilling yet another reset theory prediction, SDM was pathoselective, improving diseased cells without affecting healthy ones. Linear regression analysis showed that the worst eyes before treatment gained most after treatment, by all measures. Thus, by PERG and microperimetry, SDM appears to meet the basic requirements of retinal protective therapy, improving retinal function in a variety of unrelated chronic progressive retinopathies independent of imaging and visual function change.10,12 In the absence of adverse treatment effects, SDM can be repeated ad infinitum. Thus, using PERG to monitor retinal function going forward, treatment can be repeated as needed to maintain the retinal protective effect. The safety, simplicity, and effectiveness of SDM make it ideal for preventive treatment. Although we do not know how effective it will be in various disorders—this will take years—it is important to remember that even modest early reductions in progression rates can reap massive risk reductions over time. We have clues, however. In a retrospective study of SDM panretinal photocoagulation for proliferative DR, the annual rate of progression from severe nonproliferative DR to proliferative DR was reduced from the expected 50% to 60% to just 8.5%.13 In two other studies, none of 77 eyes with DME and visual acuity better than 20/40 treated with SDM and followed a median of 1 year required drug injection.9,14 If these are any indication of the potential risk reductions and cost savings possible using SDM for earlier treatment of chronic progressive retinopathies, we are headed in the right direction. The author thanks collaborators David B. Chang, PhD; Benjamin W.L. Margolis, BS; Giorgio Dorin; and David K. Luttrull, PhD. Jeffrey K. Luttrull, MD, is in private practice in Ventura, Calif. He is founder and executive director of Light: The International Retinal Laser Society (www.retinallasersociety.com). He states that he has no financial interest in the material described in this article. Dr. Luttrull may be reached at jkluttrull@gmail.com. 1. Elman MJ, Ayala A, Bressler NM, et al; Diabetic Retinopathy Clinical Research Network. Intravitreal ranibizumab for diabetic macular edema with prompt versus deferred laser treatment: 5-year randomized trial results. Ophthalmology. 2015;122 (2):375-381. 2. Moorman CM, Hamilton AM. Clinical applications of the micro-pulse diode laser. Eye (Lond). 1999;13:145-150. 3. Laursen ML, Moeller F, Sander B, et al. Subthreshold micropulse diode laser treatment in diabetic macular oedema. Br J Ophthalmol. 2004;88:1173-1179. 4. Figueira J, Khan J, Nunes S, et al. Prospective randomised controlled trial comparing sub-threshold micropulse diode laser photocoagulation and conventional green laser for clinically significant diabetic macular oedema. Br J Ophthalmol. 2009;93:1341-1344. 5. Luttrull JK, Musch DC, Mainster MA. Subthreshold diode micropulse photocoagulation for the treatment of clinically significant diabetic macular oedema. Br J Ophthalmol. 2005;89:74-80. 6. Mainster MA. Decreasing retinal photocoagulation damage. Principles and techniques. Semin Ophthalmol. 1999;14(4):200-209. 7. Blumenkranz, MS. The evolution of laser therapy in ophthalmology: a perspective on the interactions between photons, patients, physicians, and physicists: the LXX Edward Jackson Memorial Lecture. Am J Ophthalmol. 2014;158(1):12-25. 8. Luttrull JK, Dorin G. Subthreshold diode micropulse laser photocoagulation (SDM) as invisible retinal phototherapy for diabetic macular edema: a review. Curr Diabetes Rev. 2012;8:274-284. 9. Luttrull JK, Sinclair SD. Safety of transfoveal subthreshold diode micropulse laser for intra-foveal diabetic macular edema in eyes with good visual acuity. Retina. 2014;34(10):2010-2020. 10. Luttrull JK, Chang DB, Margolis BWL, Dorin G, Luttrull DK. Laser re-sensitization of medically unresponsive neovascular age-related macular degeneration: Efficacy and implications. Retina. 2015;35(6):1184-1194. 11. Odom JV, Holder GE, Feghali JG, Cavender S. Pattern electroretinogram intrasession reliability: a two center comparison. Clin Vis Sci. 1992;7(4):263-281. 12. Luttrull JK, Margolis BWL. Prompt improvement in macular function following panmacular subthreshold diode micropulse laser (SDM) retinal protection as prophylaxis for age-related and inherited retinal degenerations. A model for functionally guided disease management. Paper presented at: American Society of Retina Specialists Annual Meeting; July 11, 2015; Vienna, Austria. 13. Luttrull JK, Spink CJ, Musch DA. Subthreshold diode micropulse panretinal photocoagulation for proliferative diabetic retinopathy. Eye (Lond). 2008;22(5):607-612. 14. Luttrull JK, Sramek C, Palanker D, et al. Long-term safety, high-resolution imaging, and tissue temperature modeling of subvisible diode micropulse photocoagulation for retinovascular macular edema. Retina. 2012;32:375-386.